2ND LT. WALTER R. HOFMAN'S SILVER STAR CITATION FOR THE KYLL RIVER CROSSING AT EHRANG, GERMANY 5 MARCH 1945. "For gallantry in action in Germany on 5 March 1945. Upon completing a reconnaissance mission in the Kyll River area, Lieutenant Hofman observed that heavy casualties were being inflected among the infantrymen seeking to force a crossing of the river at Ehrange. Under incessant enemy fire, he fearlessly exposed himself to assist in the evacuation of the wounded men. After working for twenty-four hours without rest, he proceeded to the crossing site, reorganized the infantry and engineers and moved them upstream where the fire was less intense. Then, disregarding his personal safety, he supervised the successful crossing of two assault companies. Lieutenant Hofman's inspiring leadership and gallant conduct throughout the action made possible the establishment of a bridge head on the enemy-held shore and brought the highest credit upon himself and the Army." Posthumously awarded 17 July 1945. Buding, Lorraine, France: February, 1945. Staff Sgt. Kenneth Alberry (left) and 2nd Lt. Walter R. Hofman pose adjacent to a minefield - the small sign behind them reads "Minen!". 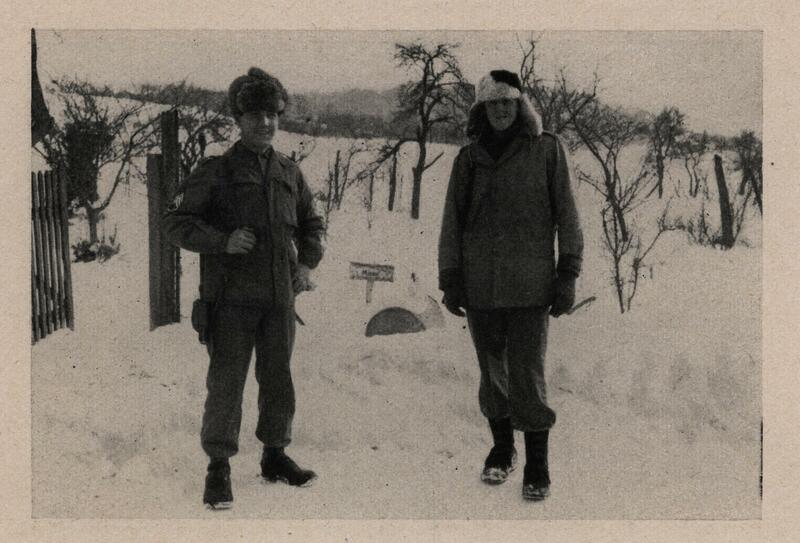 Both men appear to be wearing captured German Army headgear known as "Pelz Mutzen" or rabbit fur caps. While riding in a jeep near Bad Sulza, Germany about 11 April 1945, Hofmann, Alberry, and Pfc. Richard Holt were ambushed. Alberry was killed instantly and Holt was wounded in the right eye by mortar shell shapnel. Lt. Hofmann apparently returned to the ambush point to see if Alberry was dead when he was also killed. Holt survived and was evacuated to an American field hospital. Sgt. John C. Vernon said of Lt. Hofman, "We knew he was fearless..".